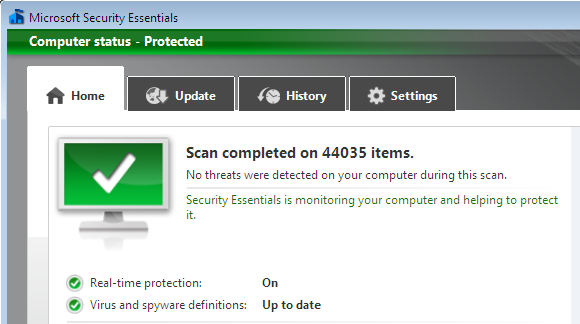 Since Microsoft released Microsoft Security Essentials(MSE) couple of years ago, I stopped worrying about antivirus programs on all my Windows PCs. MSE is just awesome and it’s the best free antivirus available in the market. New protection engine – Heuristic scanning engine is introduced to bump the virus detection and cleaning mechanism. Network inspection system to monitor network traffic as we browse and protects us from malicious scripts and programs. With this upgrade, MSE is irresistible antivirus application to have on every Windows PC. Generally upgrading Microsoft applications are kids play. All one would require to upgrade is to go to Help->Check for upgrades menu option and follow the wizard to complete upgrade process. Microsoft Security Essentials 1.0 to 2.0 upgrade is also expected to be this way, but somehow it’s not working for me in India. May be I guess, MSE 2.0 is not released for Indian users. What ever may be the reason, it’s very easy to upgrade MSE 1.0 to 2.0 manually. Just download the installer from Microsoft(link given below) and run the installer. Choose Upgrade option when the installer is executing to have MSE 2.0 installed on your PC. You can download Microsoft Security Essentials 2.0 at Microsoft Download Center. For your information, it’s a bloody useless program! why do you think so? Any specific problem you are facing with this app?